Michael G. Seamans | American Red Cross Following Hurricane Florence, Donald Speight looks over the flooding in his neighborhood right outside of Lumberton, North Carolina. Thousands were displaced by the disaster, and family and friends are using services like the Red Cross virtual call center to be reconnected with them. When natural disasters like Hurricane Florence hit, houses and other personal property aren’t the only things that gets torn apart. Oftentimes, family members are separated, or relatives and friends in other cities or states cannot locate loved ones who have been displaced. This is where the American Red Cross comes in to help provide peace of mind. “There’s our Safe and Well website, which people can use online or via text. “A lot of people in the shelters use it,” said Lynne Gump, executive director of the American Red Cross Northern Miami Valley Ohio Chapter, which serves Champaign, Clark, Darke, Logan, Miami and Shelby counties. On the Safe and Well website — located at https://safeandwell.communityos.org/cms/ — those affected by disaster can let their families and friends know they are safe, and in turn, concerned family and friends can search a database of registrants. For those seeking a more personal experience, there’s a virtual call center that puts a human face — or in this case, voice — to their search. “This is relatively new. We used it in Hurricane Harvey and Hurricane Lane, and now with Hurricane Florence,” said Gump, who has been working for the virtual call center since last Saturday. Some calls last mere seconds, while others might be longer. Sometimes, Gump said, people just need someone to reassure them and calm their fears. “We might have a call where they’re leaving a message, and that takes no time. Another time, I had a call that took 45 minutes because she was so worried and wasn’t ready to hang up yet,” she said. Callers phone in looking for relatives with health problems, who are considered a priority, and sometimes this leads to what Gump termed “putting boots on the ground,” i.e., sending someone to personally check on the individual. “For example, we had someone calling about their mom, who’s in her 80’s and ordinarily is fine, but at night, she sleeps with oxygen. We bump those calls up from virtual to non-virtual. We add a little more manpower to it and have a police officer or guardsman do a welfare check,” Gump said. Social media also has been beneficial to the reunification process, she noted, recalling a gentleman caller who was unable to locate his mother, who lived in a nursing home. Calls come from near and far, and even include international inquiries. “We just had someone calling from Japan,” Gump said. Gump said her favorite call so far was from a California woman who, during her quest to find her relatives, dialed a wrong number and reached a woman who lived in the same city as her family. Volunteers are always needed for the virtual call center as well as other efforts. Training provided for the call center is twofold, covering casework and the technical side of the job. Trainees learn to do database searches, as well as how to use Skype and the Safe and Well website, among other skills. 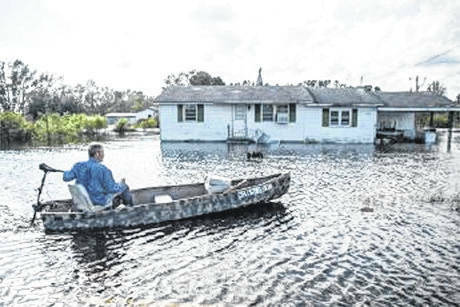 https://www.urbanacitizen.com/wp-content/uploads/sites/36/2018/09/web1_flooding.jpgMichael G. Seamans | American Red Cross Following Hurricane Florence, Donald Speight looks over the flooding in his neighborhood right outside of Lumberton, North Carolina. Thousands were displaced by the disaster, and family and friends are using services like the Red Cross virtual call center to be reconnected with them.